Is Sugar Affecting Your Fertility? When attempting to start a family – we learn fairly quickly the importance of nutrition. But did you know that just as there are nutrients that assist and sustain healthy fertility, there are also anti-nutrients that can negatively affect your fertility? Sugar: From a scientific standpoint sugar is known as “sucrose” – two simpler sugars stuck together: fructose and glucose. In a recipe, a little bit of acid (i.e. lemon juice or cream of tartar) will cause sucrose to break down into these two components. Sugar is a carbohydrate and is found naturally in most plants. According to a recent study done in 2015 by Euromonitor, the average American consumes about 32 teaspoons of sugar per day. (To give you perspective, that’s just slightly more than what is consumed from drinking 3 – 12oz cans of Coke.) To compare – an average person today consumes in 2 weeks what a person in the 1700s consumed in an entire year! Of course in the 1700s they got their sugar intake mainly from healthful, natural fruits. Today – well it comes from just about everything that goes in our mouth. Why Does the Amount of Sugar I Eat Matter? ​So let’s backup to what we mentioned at the beginning of this article – sugar is an anti-nutrient. That means it requires some of the nutrients you already have stored in your body, in order to metabolize and process, nutrients like B vitamins, vitamin C, calcium and trace amounts of potassium, magnesium, zinc, chromium and sodium! This means, that consuming foods high in sugar (this includes HFCS), depletes your bodies stored reserves of these nutrients. To put it simply – this means it provides calories and that’s it. So if you ate enough sugar, and nothing else, your body would eventually be stripped of all its nutrient reserves and you would eventually die. But before you got there – you would just walk around miserable and sick with your body not functioning properly. What are the Effects of Sugar on Fertility? Have I scared you? I’m not trying to – but the amount of sugar in your diet is a very big deal. I passionately believe that couples who want to make a baby need to have the facts. A lot of people seem to know a lot about ‘diet’, but not-so-much about nutrition. There is no magic pill you can take, as every part of your diet and the nutrients it does (or doesn’t) provide your body, lays the foundations for a healthy – or not so healthy – egg and sperm. In your effort to prepare for pregnancy, you and your other half have likely learned a lot about ‘diet’. But how much have you actually learned about nutrition?… All the little micro-nutrients that dance throughout your body throughout the month in order to prepare for pregnancy?Nutrition – not just diet – is important! Within this foundation, we find that one of the major components that we need to keep tabs on in our body is our blood sugar. A healthy blood sugar level is key to your overall health, as too much is a major hormone disruptor and has a negative impact on the fertility process. Maintaining good blood sugar regulation is extremely important to give yourself the best possible chance of getting pregnant fast. We all need sugar. It is required for our bodies to function properly. 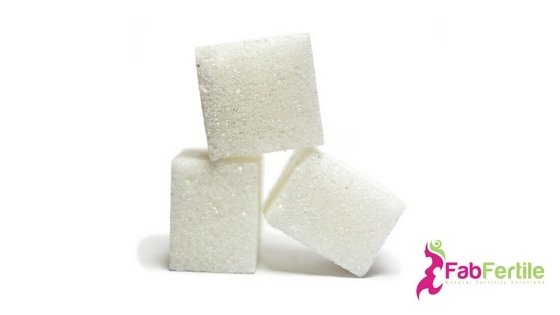 By sugar, I am referring to “glucose” – the sugar found in our blood (blood sugar). It’s the simplest of the carbohydrates, making it a monosaccharide and along with fat; glucose is one of the body’s preferred sources of fuel in the form of carbohydrates. People naturally get glucose from bread, fruits, vegetables and dairy products. You use it for everything from walking and talking to breathing and thinking. Normal blood sugar range is between 80 to 100 mg/dL with 89.9 mg/dL as a good baseline, some research suggests even lower levels such as 70-85.After you eat a meal, your blood sugar levels rise will rise and fall as your body either uses the energy it had received or stores it away. The bloodstream can only handle about 5 grams of glucose at any one time, which is equal to one teaspoon; too much is toxic to the body. When we eat, our body alerts the pancreas that it needs to release insulin to deal with the rising blood sugar level. The body actually works very hard to get it out of the bloodstream quickly because of this very fact. How Does Blood Sugar Impact Fertility? Sugar depletes essential vitamin and mineral stores. In order for our bodies to function efficiently, they require balanced hormones. In order to balance our hormones, they require specific amounts of vitamins and minerals. And sugar messes with this. When our vitamin and minerals are low, it can lead to amenorrhea, irregular periods, lower immunity, increased infection (which can be a factor in miscarriage), increased anxiety, depression and gut health issues like irritable bowel syndrome. The take away of all this? One of the best things you can do for yourself and your future baby is to reduce your sugar intake! 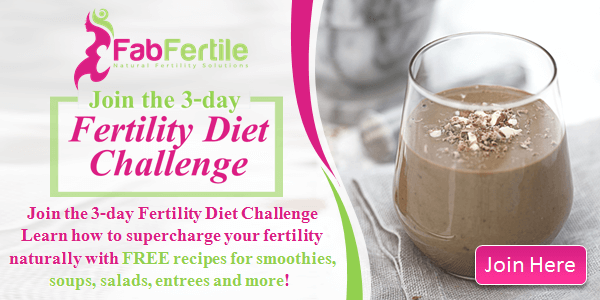 Join the Fertility Diet Challenge to learn how to get started!